In the earliest days of the Magic Kingdom, many of those areas of the park which we today think of as being fairly integral were barely there at all. Tomorrowland was a long walk along a construction fence, Adventureland dead ended at the Tiki Room, and for the first few years the view at the end of Frontierland was essentially a mound of dirt, with a big green field where one day we would enjoy Big Thunder Mountain. Tom Sawyer Island was a knee-high grassy knoll dotted with white rocks. Along the back stretch of track for the Admiral Joe Fowler, things improved, with such static tableaus as the Banjo Cabin from which some banjo strumming could be heard, an Indian Village with no Indians, that burning cabin, and the just out of sight but boisterous river pirates in their cave hideout. Within the first few years additional figures began to appear such as those Indians, their burial ground, Indian totem poles, moose, deer, and elk. The event of the 1973 construction of Tom Sawyer Island required the draining of the Rivers of America and so WED took the opportunity to add Beacon Joe and his dog Rufus to the Banjo cabin, more Indians at the shoreline of the river, and more wildlife on both the train and riverboat sides of that back stretch. A lot of this stuff is still there today. But the construction of Tom Sawyer Island did cause the removal of some things, and these were probably the first items ever placed along the river for the entertainment of those plowing the river via riverboat, keelboat or canoe: whimsical little wood buoys marking various points along the river. These can still be observed today, marking such places as Raccoon Point and Howling Dog Bend, and their number is perhaps eight. Originally there were perhaps a dozen overall, and the mystery of this week is: what were they? It's a pretty good bet that in the early days at least a few were the same: Devil's Elbow has always been where it is in the river, and I'm willing to bet that the sign for Howling Dog Bend was where it is now or perhaps across the river. 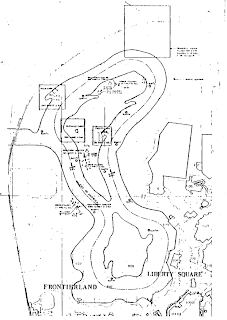 To the left, click to expand a 1973 blueprint prepared for the construction of Tom Sawyer Island; close observers will note not only the locations of the 12 original buoys scattered around the island, but the original Frontierland train station, an unusual location for some of the fake deer near where the exit of Big Thunder Mountain is today, and that mystery structure in Liberty Square I discussed in our last installment. It's a minor mystery, for sure, but so little material exists today documenting what an October or November 1971 experience of Walt Disney World was like that we should treasure these things when we get them. I, for one, would like to know what the little signs said and where they were. For example: there's a little one out by where the main river branches westward to go to the Riverboats' spur line. The buoy marked "Twin Rivers Bend" today sits near the Big Thunder Mountain geysers, but wouldn't it make more sense at this more northerly location? What sign marked where the Tom Sawyer Island barrel bridge is now? Or Tom's Landing? The current set of location markers is Disney writing at it's best at writing evocative nonsense, with exciting locations like Tree Snag Reef or Deer Crossing Shallows. 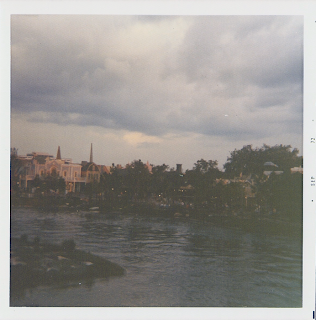 One can only imagine the now removed other exciting locations - probably lost to history in the Magic Kingdom's early but very transformative years. The role of diagetic vs. non-diagetic elements, especially, particularly, and almost solely music, is a much contested and unreliable mode in the Disney parks, especially in light of their efforts to construct a fairly fully realized "reality" when operating in the Stratification mode. Contesting sightlines are eliminated, distractions are screened out, and the whole unitary environment is made as polished and real – hyper-real – as possible. Some definitions are in order now. Diagetic elements, or diagesis, are defined as any one "operating element" of a scene, environment or fictional world which is motivated by or explained by elements organic to that world. The prevalence of non-diagetic music in the world of motion pictures is an institutalized element of those operating realities, ie, John Williams music blaring throughout Raiders of the Lost Ark, “inhabiting” environments where the entire London Symphony Orchestra would be unlikely to be located. This tradition likely draws back to the tradition of live music before, during, and after silent cinema – from an upright piano for poor theatres all the way up to huge organs of full orchestras for the largest movie palaces. Similarly institutionalized in cinema is an awareness of the prevalence of non-diagetic music in the film world; as early as 1931 William Wellman was limiting the music in The Public Enemy to onscreen bands, musicians and phonographs. The only song heard in that film is the 1919 sentimental ballad “I’m Forever Blowing Bubbles”, a piece contrary to the brutal film, which pays off when James Cagney falls through his mother’s doorstep dead as her Edison drones out the whimsical tune, then slows and dies. European film tradition limited the use of non-diagetic music through the 1960’s, in the French “poetic realistic” cinema by Renoir and others, and the “new objectivist” cinema of Germany’s years immediately before their slide into fascism. Ingmar Bergman’s films of the 1950s and 1960s tend to reserve non-diagetic music for moments of high drama or fantasy. And the modernist and post-modernist cinema of Europe often seeks to limit significantly or otherwise expose the use of non-diagetic music as in Antonioni’s Blowup, where the soundtrack eventually dwindles to silence, or Godard’s Contempt, where a single piece of orchestral score is repeated over and over again with no variation in an effort to made the audience aware of the practice. Less clear are the boundaries between film diagetic and non-diagetic music, and although the rule often is that any music is or becomes diagetic when a source is shown, some filmmakers commonly use diagetic music to bridge gaps between scenes in a non-diagetic way, such as in The Godfather when a montage bridging several months of “plot time” is tied together by diagetically motivated score played on a piano in the preceding shots. In Kubrick’s Eyes Wide Shut, non-diagetic film score is revealed to be diagetic when the main characters leave their apartment in the first scene and turn off a radio, thus halting the main title music. While few films ever fully remove non-diagetic music – The Birds is a single common example – the limitation of music for very particular moments is fairly common is American cinema. John Ford preferred to use folk tunes and ballads to “orient” his audiences in the American myths he was creating; Daryl F. Zanuck judiciously and sparingly placed Alfred Newman’s soundtrack, mostly a single accordion playing “Red River Valley”, throughout his film of Grapes of Wrath and its’ minimal appearances in the film are emotionally devastating. Disney has never been one of the film makers comfortable with such concepts, and his breakthrough success was based entirely on the novelty that diagetic space and non-diagetic sound can interact in synchronization - his films are filled with wall to wall didactic classical soundtracks which lead the audience by the nose through the story's paces. It hasn't helped his reputation with scholars but it is the tradition which the Stratification parks operate in; the narrative tradition of the reassuring Hollywood soundtrack where every emotional beat is thoroughly underscored. Disney uses period or location appropriate music to underscore the atmosphere of their Stratification-oriented parks; drum music in Adventureland and marches in Liberty Square. Some of the musical choices are somewhat suspect per the time period presented (the 1940’s cowboy songs of I’ve Got Spurs That Jingle Jangle Jingle and I’m an Old Cowhand sit alongside real folk tunes like The Old Chisholm Trail in Frontierland), the music is assertive and omnipresent. In some ways this is desirable and appropriate – the Soarin’ Over California film is artless without its Jerry Goldsmith music, and although Impressions du France is significantly better shot and edited, its’ Buddy Baker soundtrack makes a travelogue into a stirring short film. Disney similarly uses the persistent music soundtracks of the Magic Kingdom to mask out other undesirable sounds – garbage collection, attraction sound cues, vehicles and more. The soundtracks command attention away from anything “other” toward the diagesis of the environment. There are, of course, varying degrees of diagesis. Marc Davis probably preferred diagetic music in his attractions and when you enter the part of the Haunted Mansion he is most responsible for, the music becomes consistently motivated by on-stage elements: the ballroom organ, graveyard band, singing busts effect etc. Yet this often distracts spectators’ estimation of non-diagetic elements in the Claude Coates portion of the attraction, like the organ dirge heard in the entry area or the low, almost subliminal music in the loading areas and séance circle. There are non-diagetic music scores in Pirates of the Caribbean, too, like George Bruns’ “Scare Me Music” or the almost-motivated accordion which subtly underlines the Auction and Chase scenes in the seaport. These elements are generally of the “felt but not heard” variety, a subtlety which cannot be applied to the outside general music loops. In fact, the only general area music which is clearly diagetic is the Fantasyland carousel music, which doesn’t always emanate only from the carousel but is at least motivated by it. The largest noteworthy variant from the non-diagetic pattern in the golden era of Disney theme design of 1963 – 1982 is, to my mind, the Magic Kingdom Adventureland of 1971. Marc Davis’ influence looms large in this area, perhaps explaining the approach. The area was not originally graced with the tropical drumbeats it currently offers, but a central plaza where the key sounds in 1971 would’ve been the Tropical Serenade’s Wally Boag toucan, the tapestry of jungle sounds emanating from the Jungle Cruise, Marc Davis’ drumming tiki figures, and the Swisskapolka raining down from on high from the Treehouse. The last piece of music which was probably in place on or around opening day in 1971 has recently come into the public sphere online, which is a piece of music once played in the Adventureland Veranda at the land entrance. It does consist of non-diagetic, canned “exotic” music, but throughout the piece of music is a curious, mild clinkling between songs, like wind chimes. Chances are, this sound is intended to tie into an element in that old Magic Kingdom eatery: a number of wind chimes hanging in the show scene balconies along the inside of the restaurant made of shells. With the tinkling chimes on the breeze, filling the space with “room tone”, the non-diagetic music swells out of it, like a dream. Speaking of Adventurelands, an interesting effort towards creating a land dismissed of any non-diagetic music is the 1994 Adventureland at Disneyland, where many unique radio “loops” were recorded to fill the streets with radios and CB radios broadcasting all manner of period music, news updates and casual banter. The addition of the Tarzan overlay to the Swiss Family Treehouse as of curse compromised this aesthetic as where once a fairly motivated organ piece played, now there is, well, Phil Collins. There are many other examples on both counts, including some which are probably debatable and open to interpretation, like that radio at the start of Eyes Wide Shut – Disney can only in the end guide and coax our experience of their parks and there thus can never truly be that single authorial hand which is the foundation of the argument for film as a potential art. And yet if we do try to view the themed space as a kind of an extension of filmic “space”, oughtn’t we also see the non-diagetic music which informs so much of our experience in the Magic Kingdoms and other places as an essential failure of design? The music which constantly informs also constantly leads, suggests, curtails possible alternate readings. The theme spaces can certainly stand on their own, so should there not be a concerted effort to move beyond the blaring non-diagetic music and craft a more sophisticated palette of sounds and music, to move farther from the institutionalized Hollywood soundtrack and into potentially ever more rewarding design scheme?